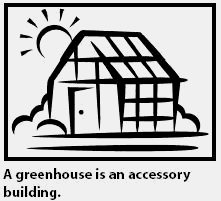 A secondary structure that exists for the benefit of the main building, such as a tool shed or a detached garage. When drafting an offer to purchase real estate, you should be sure to include accessory buildings in your description.Otherwise,easily movable sheds and other structures not permanently affixed to the soil might be removed before closing. The accessory building is used by DHS as a citywide laundry distribution facility, which will be relocated. Hanson Home Construction LLC, Wenatchee; two single family houses ($162,745 and $172,815) at 87 and 65 Sarah Drive, Wenatchee, and accessory building at 65 Sarah Drive, valued at $22,159. Right now, abutting neighbors can each erect an accessory building at the extreme of each other's property line, meaning the buildings would almost touch each other raising a serious concern in case of fire. James Gebhardt and Linda Gebhardt, Blaine; $297,052 single family house, a $21,053 accessory building and a $39,043 accessory building. Under the proposed zoning change, to be aired at a required public hearing Wednesday in Shepard Municipal Building, a detached accessory building will need a front setback of 25 to 40 feet depending on the zoning district it is in, and a side and rear setback of 10 to 15 feet. Tenders are invited for Construction of a new approx 6,190 SF fire station, approx 500 SF accessory building, and all associated site work. Tenders are invited for Purchase and installation of a pre-fabricated accessory building. Wenatchee; $60,000 for commercial accessory building at 14042 U.
Connie Dietz and Kevin Dietz, Wenatchee; $172,800 commercial accessory building at 4263 12th St.
Unit A; Converting Accessory Building To Secondary Dwelling Unit. James and Susan Koempel, 8153 Hall Road, Cashmere; $396,480 commercial accessory building at 6162 Battermann Road, East Wenatchee. Appeal of approval of 4,000-square-foot church accessory building (owner: Western Oregon Conference Association of Seventh-day Adventists).